Fall means moving the fun indoors, comfort food and savouring favourites not seen yet this year. With heartier fare comes heartier beer, and a chance to experience different brews beyond lagers. Our suggestion with the chillier temperatures, a hearty bowl of warm chili. In a large soup pot, heat olive oil over medium-high heat. Add onions and sauté for two minutes. Add garlic and sauté for an additional minutes. Next add the turkey/chicken/beef. Mix often to ensure meat is cooked thoroughly and sauté for about ten minutes. Carefully pour fat out of pot (making sure to leave onions, garlic, and turkey in the pot). Return pot to heat. Add one bottle of Cameron’s Auburn Ale, honey, crushed tomatoes, tomato paste, chili powder, cumin, and cayenne to mixture. Stir to mix and let it simmer for about 30 minutes. Now it’s time to add the remaining Cameron’s. Simmer for an additional 30 minutes and then add black beans. Stir to mix and simmer for a final 30 minutes. Serve in big bowls and garnish with green onions. Serves 8-10. Cooking with Cameron’s doesn’t just happen at home. Since January 2011, Cabbagetown’s Stout Irish Pub in Toronto has offered up their Cameron’s Fish & Chips, with delicious haddock battered using the award-winning Cameron’s Dark 266. 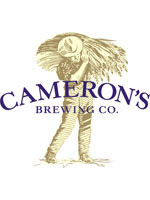 Cameron’s Brewing Company is a true craft brewery, passionately brewing all natural ales and lagers since 1997 in Oakville, Ontario, Canada. Winner of a gold and bronze medal this year at the Ontario Brewing Awards along with a silver at the recent Canadian Brewing Awards, Cameron’s is currently available at The Beer Store, select LCBO locations and on tap at numerous bars and restaurants such as Earl’s, C’est What, Stout Irish Pub, Langdon Hall, the Royal Canadian Yacht Club and more. For more information about Cameron’s and its availability, please visit www.cameronsbrewing.com.